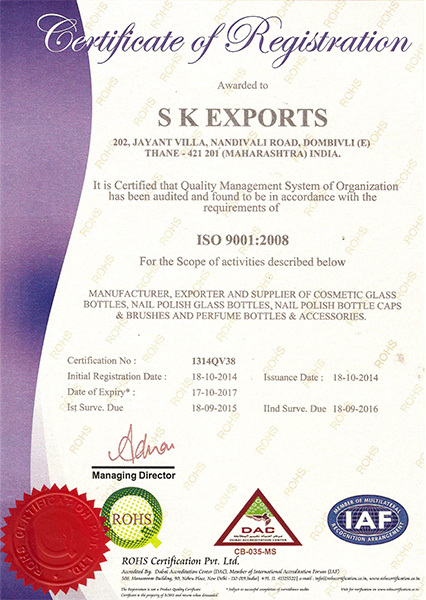 S K EXPORTS Mumbai India are into export/supply and manufacturing of Nail polish Glass Bottles ,Caps ,Brushes and Nail art brushes in various designs and quality. We do business in major countries worldwide, like US, UK, Middle East, Africa, Australia, Brazil, Poland, Costarica, Mexico, Colombia, Gulf like Sharjah UAE, Peru etc. 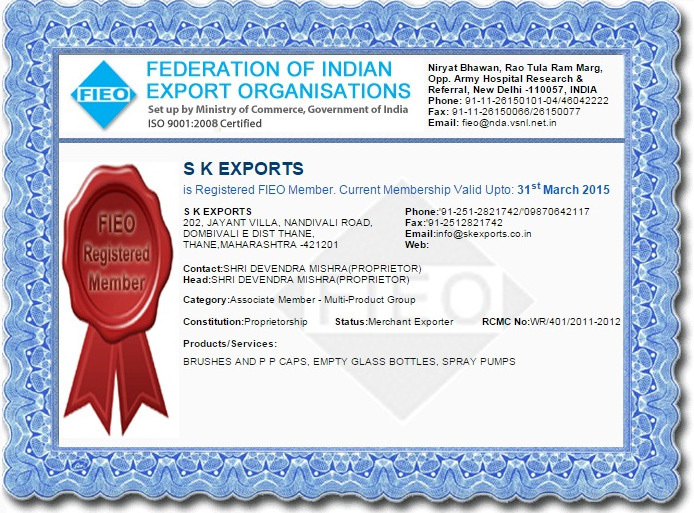 Also we manufacture and export the Perfume Glass Bottles, Caps and best quality Sprayers. Perfume Bottles- available in various attractive designs and size like 30ml to 120ml size. Perfume Caps are available in PP materials and in Aluminum materials (inner PP) and in Serlyn materials in very good designs. Spray Pumps are available in Plastic and in Aluminum materials in 15mm neck and 20mm neck size. Glass Cream Jar are available in various size and attractive designs. PP Cream Jar/Cream Container are available in best quality and different size like 50, 100, 200 grams etc or as per customers requirement. Glass Pharmaceutical Vials and Ampoules- Available in ready mould in various size like 1ml , 2ml, 3ml, 5ml, 10ml,etc or as per customers requirements in clear transparent High quality glass and in amber glass also. We have in house facility of Coating , all types of printing and frosting (acid etching) on glass bottles. We also develop new designs of cap and bottle as per customer specific requirement. We have been able to dispatch quality products and so, win the trust of clients. Besides, his rich domain knowledge and experience have enabled us to gain a reputed name in the industry.